At MTU we've gained a reputation for build- ing quality marine die- sel engines. Yet, while maintaining the highest design and production standards, weve solved a lot of the prob- lems related to fuel efficiency. 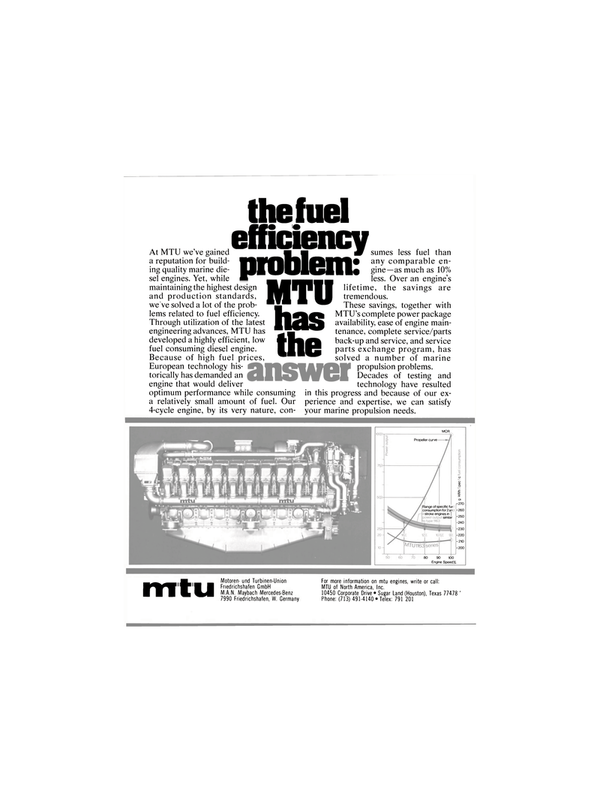 Through utilization of the latest engineering advances, MTU has developed a highly efficient, low fuel consuming diesel engine. European technology his- torically has demanded an engine that would deliver the fuel efficiency problem: MTU has the sumes less fuel than any comparable en- gine—as much as 10% less. Over an engine's lifetime, the savings are tremendous. MTU's complete power package availability, ease of engine main- tenance, complete service/parts back-up and service, and service parts exchange program, has solved a number of marine propulsion problems. Texas Friedrichshafen GmbH MTU of North America Inc.